Symplocos tinctora.Ted Bodner, hosted by the USDA-NRCS PLANTS Database.James H. Miller and Karl V. Miller. 2005. Forest plants of the southeast and their wildlife uses.University of Georgia, Athens. (Accessed 8/2014). Symplocos tinctoria is a shrub to 5 m tall, semi-evergreen, somewhat colonial from root-sprouts (suckers). 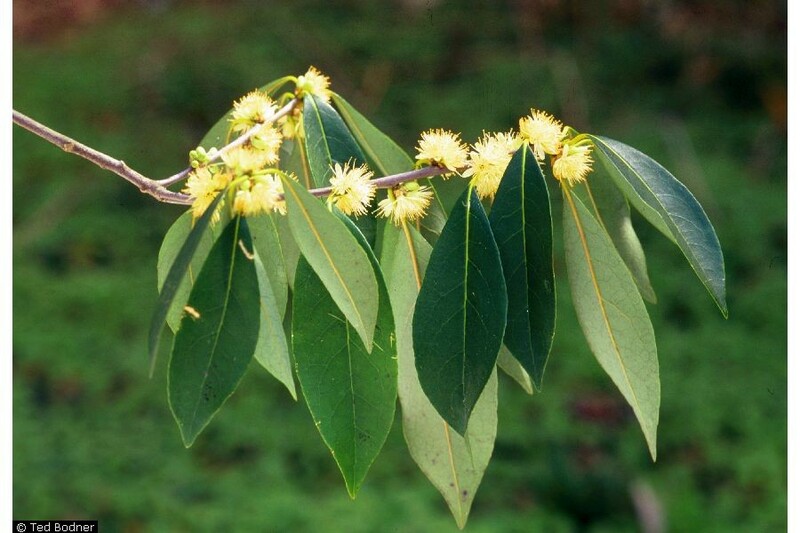 Leaves alternate, inversely lanceolate, to 15 cm long, tip pointed, tapered to base, margin few-toothed, surface dark green, paler, finely hairy below. Flowers yellow, radially symmetrical, fragrant, 5-parted, petals fused near base, lobes 0.7-0.9 cm long, stamens numerous, more conspicuous than corolla, in clusters alternating with petal lobes; inflorescence of axillary clusters on growth of previous season. Fruit hard-fleshy, pale green, 0.6-1.0 cm long, elliptic. Origin: Native to Delaware and south. Habitat: Moist to wet woods, also planted, possibly escaped from cultivation. Soil pH 4.5-6.5 (USDA, NRCS 2010).